BiznextIndia : Hindalco Industries, the largest producer of Aluminium in the country has temporarily suspended the operation at its Alumina Plant at Muri, Jharkhand owing to spillage in the red mud cake storage area. The barrier of the red-mud pond collapsed yesterday at 1.30 pm. According to eyewitnesses at least one person had reportedly been died and several others have been trapped in the mud. Indian Railways has also stopped or diverted several trains as the red mud has spread across the nearby trainlines. 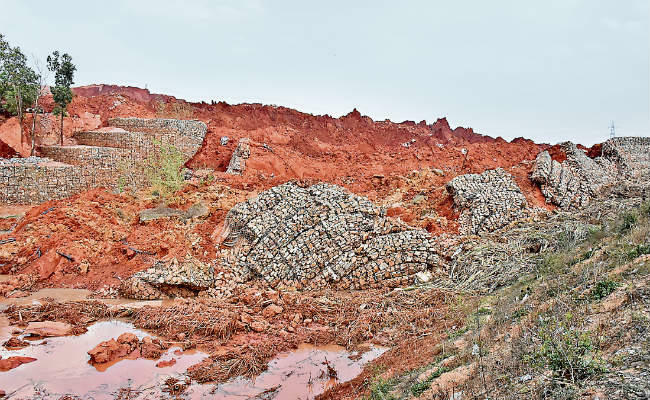 “There was an incident in the red mud (bauxite residue) storage area connected to the alumina plant situated at Muri, Jharkhand, on 9th April 2019. The incident involved a spillage in the red mud cake storage area” the company said in a regulatory filing. “As a precautionary measure, operations have been temporarily suspended to assess the situation. Preliminary investigations indicate no material impact on the surrounding environment or to property. Efforts are ongoing to clear the spillage. Four persons with minor injuries have been treated, and one contract workman is missing. This incident is not expected to have any material impact on the company’s performance” the company said.